Ahead of their time: When combined with PumpMeter and the new PumpDrive Eco, the new Etaline in-line pump is a highly efficient pump set. The innovative KSB SuPremE® IE4* motor saves even more energy and is available at no extra cost compared with the IE2 motors most commonly used until now. Etaline in-line pumps are ideal for use in heating, air-conditioning and ventilation systems. As a rule, they operate in the part-load range. The KSB SuPremE® IE4* motor is the best choice for this load profile, because here too it achieves maximum efficiencies. At an energy price of 20 cents/kWh, the annual savings per motor equal 276 €. And the savings achieved by variable speed operation have not even been taken into account in this calculation. KSB SuPremE® IE4* motors achieve top efficiencies in the part-load range. At full speed and full load their efficiency already exceeds that of the IE2 motors most commonly used until today by 4 %. At a quarter of the speed and 25 % of the flow rate, this advantage can be as high as 24 %. When looking at the typical load profile of continuously operated pump sets, the savings compared with a variable speed pump with an IE2 asynchronous motor amount to 1,380 kWh and 815 kg of CO2 per year. The main criteria for motor selection are maximum energy efficiency, maximum resource efficiency and minimum investment costs. While the latter are low for an IE2 motor, the motor’s energy efficiency is not optimal at all. By way of contrast, KSB SuPremE® offers an optimal balance; for minimum investment costs, you get maximum energy and resource efficiency. The innovative drive technology of KSB SuPremE® not only satisfies IE4* efficiency requirements, but already exceeds the legal minimum requirements of the ErP regulations applicable from 2017. The German corporate initiative DENEFF has bestowed upon KSB its Perpetuum 2014 energy efficiency award for developing the new SuPremE motor generation. Systems with an Etaline in-line pump and a KSB SuPremE® IE4* motor can be rendered even leaner by operating the Etaline with a variable speed system. A KSB SuPremE® IE4* motor alone makes the system more efficient, allowing energy savings of 30 %. 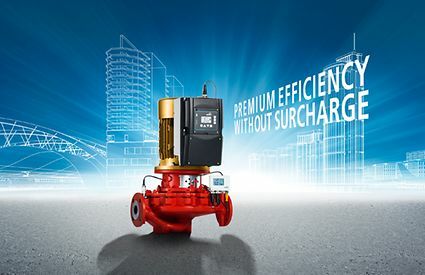 And the PumpDrive Eco variable speed system will increase your efficiency gains even more – to enable total energy savings upwards of 70 percent. So, with the new PumpDrive Eco, your Etaline in-line pump will be both reliable and highly efficient. Opt now for the world’s most efficient magnet-less pump set!